Our dentists care about you and your oral health. If you have any questions or concerns about fillings, talk to one of our dentists. They will advise you on the type of filling that works best in your particular case, and inform you about the aesthetic and cost implications for each type. - Are you taking medicine? - Do you have allergies? To fill a cavity, the dentist will first give you "freezing" (or local anaesthetic), so you do not feel any pain. The dentist then takes out all traces of decay, shapes the tooth and fills it. 1. Direct Filling - These fillings go right into the cavity of the tooth, after the dentist has cleaned out the decay. Amalgam (or silver) fillings and plastic (or white) fillings are examples of direct fillings. They harden quickly. Most of the time, you will be able to have a direct filling put in place in one appointment. 2. 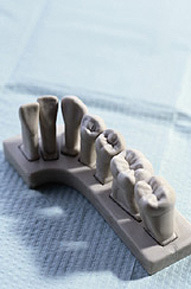 Indirect Filling - Examples of this type of filling are crowns (or caps) and inlays. They are custom made in a lab to fit your tooth. The dentist cements the filling in place. Most indirect fillings take two or more appointments to complete. Remember, our dentists are interested in you and your oral health. If you are concerned about having any particular dental restorative materials placed in your teeth, talk to your dentist and be a partner in decisions about your oral health care.